Advisor Brian Pohlman with Ag Technology and Mechanical Systems team members Cael Gostomsky, Alex Weiss, Ethan Garbig and Levi Walker are seen with event sponsors from Caterpillar Inc. and Firestone Agricultural Solutions. Arcanum-MVCTC FFA members attending the national convention were (first row, l-r) Cameron Daugherty, Anna Loxley, Alexis Wilcox, Emily Wenning, (second row, l-r) Sidney McAllister, Maggie Weiss, Kaylee Wilcox, (third row, l-r) Blayne Hess, Ryan Delk, Hannah Smith, (back row, l-r) Zach Smith, Landon Haney, Jake Goubeaux and Luke Brinksneader. INDIANAPOLIS – A highlight of the Arcanum-MVCTC FFA Chapter’s trip to the National FFA Convention was the chapter’s Agricultural Technology and Mechanicals Systems Career Development Event team being named the 16thoverall team in the nation and earning a silver rating. This team qualified for the national competition after earning first place in Ohio. Team members were Alex Weiss, Cael Gostomsky, Ethan Garbig and Levi Walker. Weiss was the highest placing individual on the team and earned a gold rating. Agricultural Technology and Mechanical System is one of 25 career development event areas, covering jobs skills in everything from communications to mechanics. The participants took a written test and demonstrated their skills through hands-on activities in machinery and equipment systems, electrical systems, energy systems, environmental and natural resources systems and structural systems. The ATMS CDE is sponsored nationally by Caterpillar Inc. and Firestone Agricultural Solutions. CDEs help students develop the abilities to think critically, communicate clearly and perform effectively in a competitive job market. A total of 18 members of the Arcanum-MVCTC FFA Chapter were in attendance at the National FFA Convention in Indianapolis. Those members from Arcanum MVCTC FFA Chapter were Maggie Weiss, Hannah Smith, Anna Loxley, Emily Wenning, Kaylee Wilcox, Alexis Wilcox, Sidney McAllsiter, Zach Smith, Blayne Hess, Cameron Daugherty, Landon Haney, Jake Goubeaux, Luke Brinksneader, Ryan Delk, Ethan Garbig, Levi Walker, Cael Gostomsky and Alex Weiss. Traveling with the Arcanum MVCTC FFA Chapter were students from the Milton-Union MVCTC and Miami East MVCTC FFA chapters. The “Just One” theme for the convention was chosen because one moment, one encounter, one opportunity is all it takes to radically change the course of people’s lives. It highlights the importance of each individual “Just One” step toward growth as members work toward the FFA vision of growing leaders, building communities and strengthening agriculture. Almost 70,000 members, parents and guests were in attendance at the National FFA Convention. Previous conventions were held in Kansas City, Missouri, and Louisville, Kentucky. 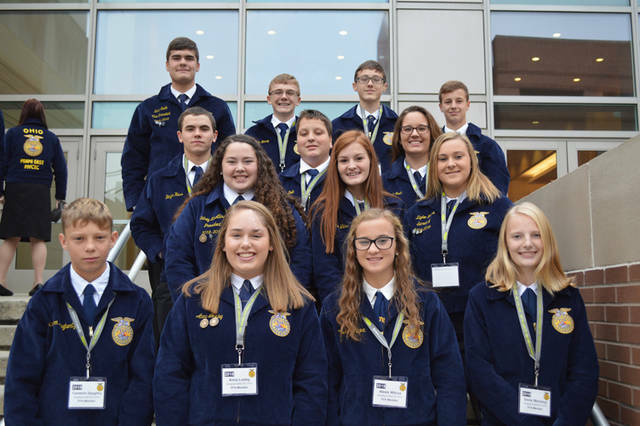 Convention activities included attending several convention sessions where members were inspired by motivational speakers such as the 2018-19 national FFA officers and motivational speakers Kyle Scheele and Mary Lapp. Attendees enjoyed attending the Garth Brooks concert, hypnotist show by Dr. Jim Wand, Buckeye Bash Dance and attending the FFA Shopping Mall and Career Show. FFA makes a positive difference in the lives of students by developing their potential for premier leadership, personal growth and career success through agricultural education. FFA membership today is comprised of 653,359 student members in grades seven through 12 who belong to one of 8,568 local FFA chapters throughout the United States, Puerto Rico and the U.S. Virgin Islands.